(1) I have installed an app on my mac that wiped out some of my browser settings including all the default templates that comes with Easy Copy. Is there an easy way to restore those? I have tried reinstalling the extension, but it does not restore the default templates. (2) As a workaround, I tried to recreate some of the templates I use the most often by looking at the template definition on another machine. The issue I am facing then is that the Easy Copy preference windows on Mac Firefox does not extend vertically enough to allow me to fully setup the template (I am missing the "Type" dropdown and the "Format for HTML" checkbox). fargaud wrote: I have used Easy Copy for the past 6 months and really enjoy the extension. Glad you're enjoying Easy Copy. fargaud wrote: (1) I have installed an app on my mac that wiped out some of my browser settings including all the default templates that comes with Easy Copy. Is there an easy way to restore those? I have tried reinstalling the extension, but it does not restore the default templates. The quickest way I can think of to restore them is to signal to Easy Copy that it should recreate the templates. This will mean that you'll have to modify a preference in the about:config, so if you're not comfortable doing that then please let me know. 1) Type about:config in your address bar, search for easycopy and look for the preference extensions.easycopy.lastPrefsVersion. 2) Right-click on extensions.easycopy.lastPrefsVersion and press Reset. All the default templates should be back. This shouldn't affect any existing custom templates you have - it should only restore the default ones. fargaud wrote: (2) ... The issue I am facing then is that the Easy Copy preference windows on Mac Firefox does not extend vertically enough to allow me to fully setup the template (I am missing the "Type" dropdown and the "Format for HTML" checkbox). This is very useful addon but one little annoying thing is that when i right click in a web form the easy copy entry is appearing inside the cut, copy, paste, delete entries in the context menu. It will be good if there is a option to make the easy copy entry do not appear when right clicking in web form. As I mentioned, I've tested Easy Copy on FF 43 and 44 and it works on both, even the Options button. I see from your reply on the Easy Copy reviews on AMO, I see that you've got it working, so that's good. If you see the problem again, it would help if you provide your OS details and what other extensions you've got installed. Sometimes it also helps to start a new FF profile, install Easy Copy and then see if the problem persists. If it works then it might point to some customisation or extensions that could be causing the issue. So what I need is a rule to clip off everything prior to "tt" and everything after the next 7 digits, leaving the bare ID in clipboard. As an alternative to getting details from IMDB, maybe you could google IMDB APIs and use something like the OMDb API to get those IDs in another way. I haven't worked with any of those so can't help any more than that, but they do seem to return the IMDB ID, although still prefixed with tt*. 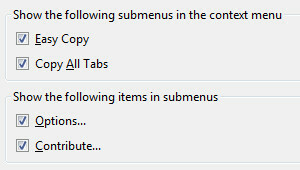 My context menu only has options and contribute. Where's the main items? when copying all tabs using a text template, is it possible to insert a line break/return between each result? Note: That that page had no Description or Keywords. but there is a problem,and it is a that don't keep format of copy text selection. is there anyway for that? and if it is not can you add it? fire.Man wrote: when copying all tabs using a text template, is it possible to insert a line break/return between each result? 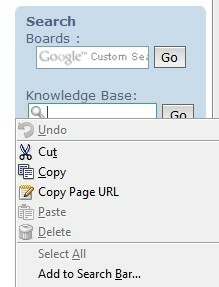 You shouldn't have to add anything when using Copy All Tabs. There should already be a line break between items, even for Text templates. It might not work if you use Notepad as Notepad isn't that flexible. It should work if you use a better editor like Word, Notepad++ or Evernote. That's an interesting idea and something that shouldn't be too difficult to implement. It would probably look something like %meta_description%, %meta_keyword%, etc. I assume what you want to do is to copy the template as text, without wanting to paste it as HTML? In that case, make sure you set the Template Type to Text instead of HTML and the selection should be copied as text only. If that's not what you're after, can you give an example of how you want it to appear and how it's actually appearing? Yes, %page_text_content% copies the whole page. If you want the text version of the selected text, then use %selection% but set the Template Type to Text. when paste content ,it is keep formatting of text. %page_text_content% do the same (Firefox copy right click) almost but get whole page not selection. [*] Downgrade to the version 44.0.3 of Waterfox with my current profile — Easy Copy returned to the full and perfect function. [*] Start of Waterfox v. 46.0.1 with a quite clean profile and installation of Easy Copy only — Easy Copy was fully and perfectly functional. I concluded that some of add-ons installed in my current profile may be the reason of problems with Easy Copy in Waterfox v. 46.0.1. Therefore, I started to block step by step add-ons installed. I found that if AutoPager Fixed 0.8.0.10.1-signed.1-signed is blocked (https://addons.mozilla.org/cs/firefox/addon/autopager-fixed/?src=search) Easy Copy is fully functional again under Waterfox v. 46.0.1. I uninstalled AutoPager Fixed 0.8.0.10.1-signed.1-signed add-on and tried another auto paging add-on to install — namely uAutoPagerize v. 0.0.5. Now, all is alright. Both add-ons, i.e. Easy Copy and uAutoPagerize work under Waterfox v. 46.0.1.
hessam_pro wrote: %page_text_content% do the same (Firefox copy right click) almost but get whole page not selection. Ah, I think I see now. I take it you're using the forum's rich text editor which allows you to paste HTML and keep formatting such as bold, colours, links, etc. * Set the template Type to HTML. Make sure "Format for HTML" is *unticked*. %html_source% copies the HTML of the current selection (or the whole page if nothing is selected). Also, for source, you can use %page_title% to get the page's title (and not the current selection). Again, set the template type to HTML and make sure "Format for HTML" is *not checked*. It's up to you which one you prefer. Hope this is what you were after. Last edited by oombii on May 3rd, 2016, 3:12 pm, edited 1 time in total.